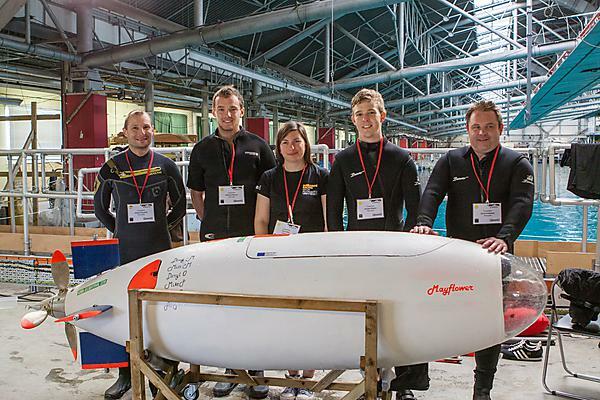 Pedal power puts University of Plymouth students in top three in international submarine race. Four mechanical engineering students from University of Plymouth have pedalled their way to third place in an international submarine race – and broken the UK record in the process. Daryl Oosthuizen, Mike Prest, Matthew Merrett and Douglas Megran were the top ranked UK university in the European International Submarine Race (eISR), which challenges participants’ engineering and sporting skills, by tasking them with designing, building and then racing a human powered submarine at Europe’s largest freshwater tank – QinetiQ’s Ocean Basin in Gosport. After five days of racing, the University of Plymouth leg-powered submarine engineering team (PULSE) powered to a speed of 4.4 knots to place third overall in the competition against teams from Canada, Germany, New Zealand, The Netherlands, the UK and USA. "We are delighted with the result. Although we designed the submarine as a part of our dissertations, its realisation has only been made possible by the combined support from local businesses, Dr Keri Collins (Project Manager) and many other university staff. It's been hard work however the skills gained and friends made along the way make it all worthwhile, and we're all extremely proud of what we've achieved." The teams are challenged to race their human-powered crafts against the clock around a demanding slalom course and are judged on overall speed, the week’s top speed, agility, innovation and on the best presentation. This year has seen almost 100 students from ten universities from around the world team up to pedal furiously in SCUBA gear in flooded, submerged submarines around the huge tank, the size of an international football pitch.